This week's topic is "Top Ten Books I'd Recommend as Good Beach Reads." I'm doing that topic, but I thought I'd add a little extra personality to it. Instead of just giving you some great beach reads, I've sorted them based on what you might be looking for in your beach read and added some extra loot to complete the "look." Hope you enjoy! 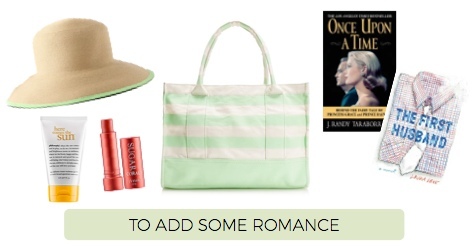 So, you want some romance in your beach reads. I've got two options for you. The first, Once Upon a Time: Behind the Fairy Tale of Princess Grace and Prince Rainer, is the story of one of the world's most fascinating royal families. Grace Kelly, gorgeous movie star, married the Prince of Monaco and forever gave up her life as a starlet. Long before Kate Middleton, she lived every little girl's dream. This book is fascinating. Despite the troubles they faced, you see their love for one another grow. The First Husband is an easy, breezy read. This fictional story of a woman who jumps into marriage following a bad breakup was such a fun read. 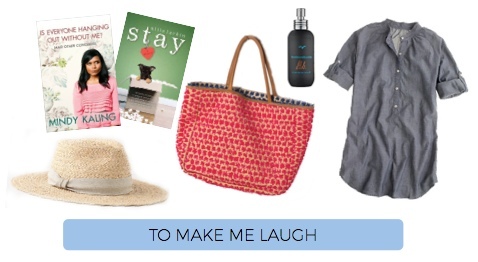 It's the perfect book to toss in your preppy beach bag. If you're anything like me, you'll fall a little bit in love along the way. The book Unbroken was unlike anything I'd ever read before. It was so engrossing that I hated going to work because I just wanted to keep reading. It's the true story of a WWII fighter pilot who is shot down over the Pacific Ocean. What happens next is true and heartbreaking... and will have you hooked. It's not your normal summer read, but I promise it'd be the perfect book for the beach. I first read The Poisonwood Bible in high school, and I thoroughly enjoyed it. The story of this missionary family in Africa is one of the best uses of multiple narrators. If you want to experience not only a different time but another continent, this is a book you don't want to miss. I loved Stay, which is the story of a girl who orders a dog from the Internet after drinking a little too much and watching her best friend marry the man she secretly loves. The puppy's arrival, and her realization that he isn't exactly the puppy she imagined, had me laughing out loud. It's just a good read, period, but you'll enjoy it even more if you're a dog lover. Do you need your beach book with lots of sweeping action? Love a good family saga? Then pick up The Tea Rose. It's a big fat book, but you'll fly through it as you soak up the sun and sip on an ice cold drink. It's the first in a trilogy, so you've always got two more books to turn to if you get done before vacation ends. 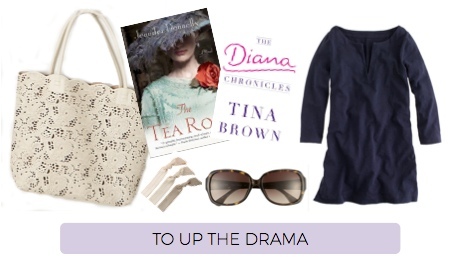 I can't think of a more dramatic biography than The Diana Chronicles. While I knew some about Princess Diana, I realized recently that I wasn't as familiar with her life as I originally thought. When I was reading this book, I couldn't turn the pages fast enough. Diana's life read like the plot of a TV show! A semi-commoner marrying a prince, adultery, eating disorders, deadly car crash... She was one interesting woman, and this book needs to be tossed your beach bag! I actually just finished re-reading Anne of Green Gables, and I loved it just as much as I did when I read it the first time (even though this was like my millionth re-read). Anne's sweet optimism and zest for life will brighten anyone's day, even when the sun is already shining. If you need to visit an old friend, don't forget about Anne! Little House in the Big Woods is another book that will make you feel nostalgic for your childhood.... assuming, of course, that you loved these as much as I did. 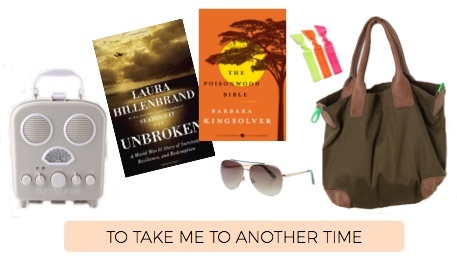 I was enchanted with Laura's life and adventures, and I've been craving a trip down memory lane. Even better? You can be reminded of your appreciation for modern conveniences while enjoying the great outdoors. Such a creative list! I loved that you broke it down into categories...I definitely choose what to read based on what I'm in the mood for. And extra points for including Anne...I love her! Anne is the best! I just love her - and I love finding others that love her, too. wow..Fantastic and the accessories make the books!!! I read your about page and really enjoyed learning more about you. Love the way you write. I'm also in the Classics Club. Anyway, enjoyed reading your list and your descriptions of the books. Thanks for stopping by! Excited to chat more about our Classics Club books! WOW. I am in awe of you and your excellent blog post writing skills. You blow the rest of us out of the water. This is such a great list, and so creatively organized! These are spectacular. I'm off to visit your recommendations! PS That retro radio lookalike is so splendid! Thanks Juju! I thought the radio thing was adorable - glad you did, too! I freakin' love this entire top ten tuesday and want every product mentioned. ALSO I WANT TO READ STAY OMFGGGG I LOVE PUPPIES ALWAYS. Also? I have been hankering to read The Tea Rose forever. And you kinda just sold me on Unbroken. AND holy crap tell me I am not the only one who ever wondered what it would be like living on the prairie and was totally jealous of Laura and her awesome adventures and family. Read Stay! It was really cute and made me laugh which is always a plus. And you should totally follow your Tea Rose hankering. It's long but goes really quickly. AND OMG UNBROKEN. YES. I'm not a huge non-fiction reader, but it's my favorite book I've read this year! I love the added photos in your post! I really want to read Unbroken now, it sounds great and I have had The Poisonwood Bible on my to-read list for a while, thanks for reminding me of it! I really hope you end up reading those two - they're both really good! I don't love all non-fiction, but Unbroken might be my favorite book I've read so far this year. UMM I love how you laid this all out!! So fancy and creative! Mindy Kaling was on our list too but I haven't read any of the other books on this list. Not even Anne of Green Gables! Which I really need to get around to reading. Stay also seems like such a fun book.